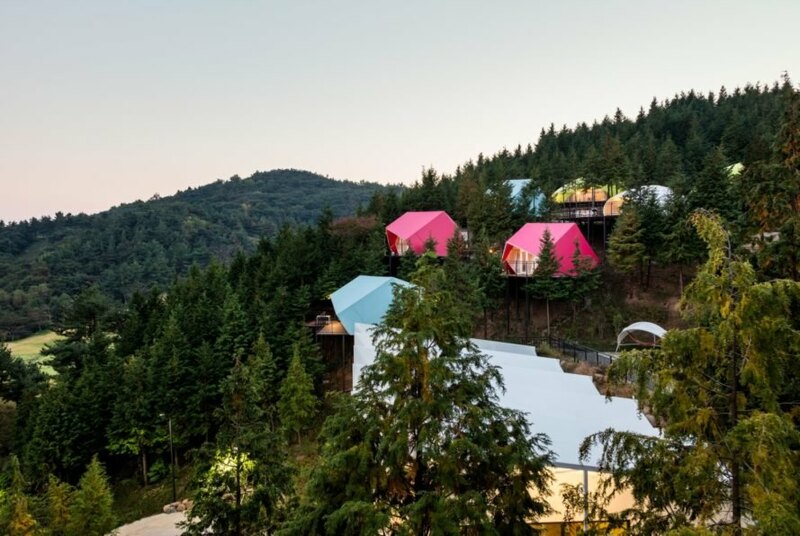 South Korean firm Atelier Chang has installed a series of colorful glamping pods in a remote South Korean mountain range. 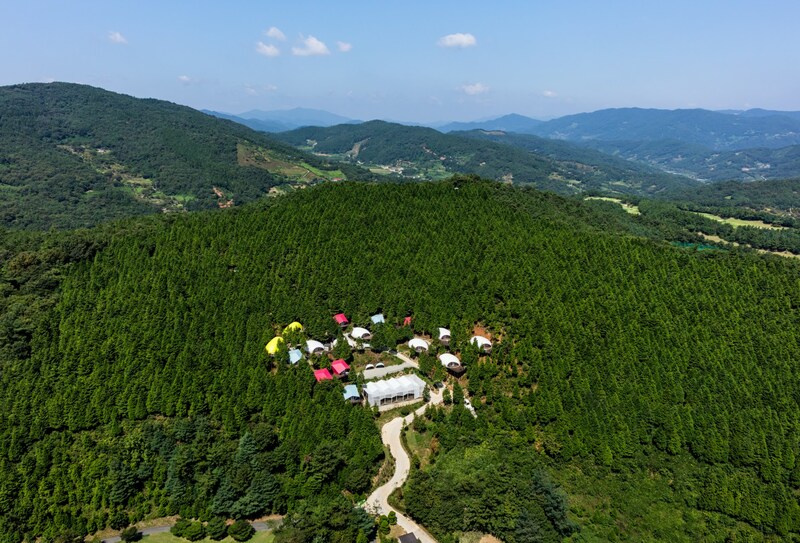 Tucked deep into a green cypress forest, the contemporary pods that make up the SJCC Glamping Resort are designed for travelers who want to enjoy exploring Suncheon Ecological Bay, a beautiful coastal area 300 kilometers south of Seoul. 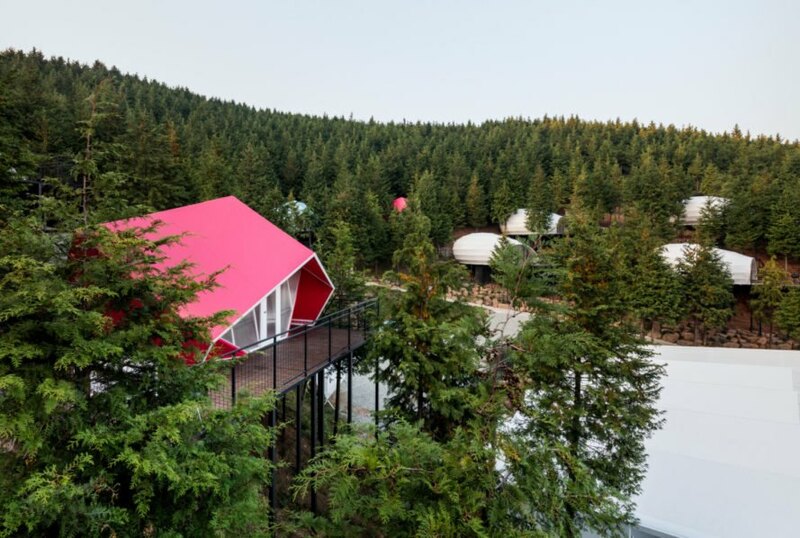 The 16 glamping pods were built with steel frames and covered with brightly-colored fabric in shades of fuchsia, bright green and powder blue. The fabric is durable enough to insulate the structures year-round, even in wintertime. The area is known for its bitter winters, but the coverings, as well as the rounded shapes of the pods, help resist strong winds and snow loading. 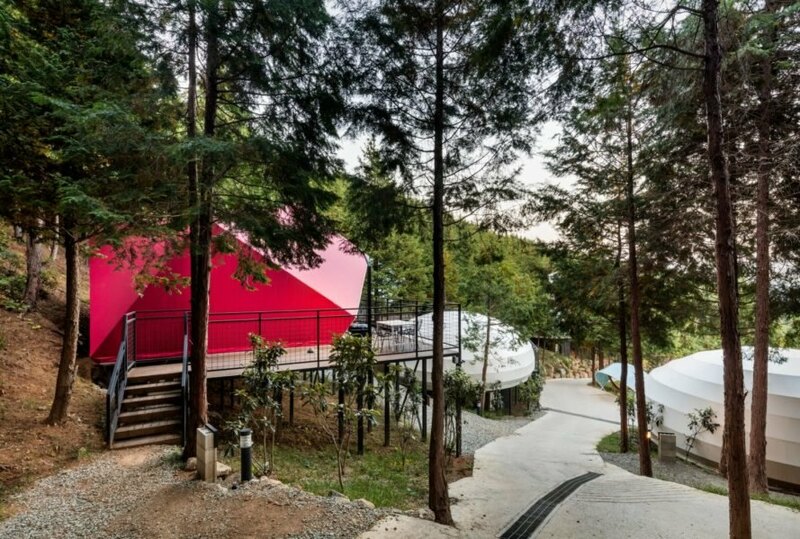 According to the architects, each of the colorful pods was strategically orientated to provide stunning views of the forest and the sea in the distance. 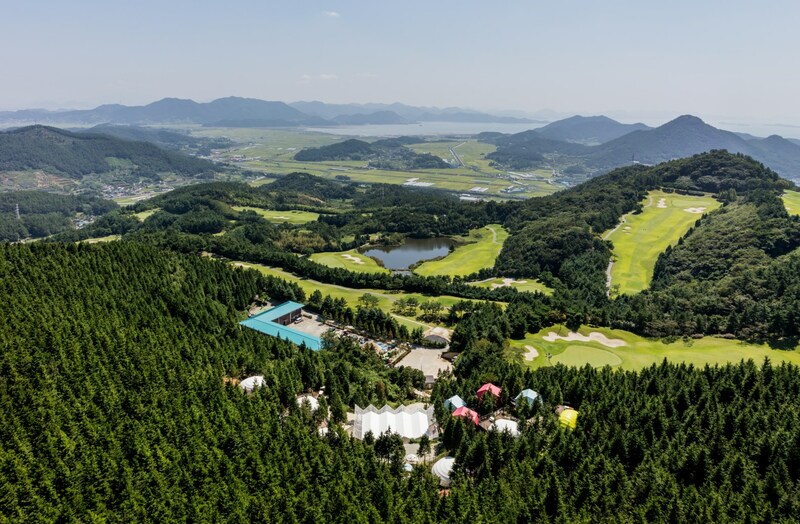 “We wanted guests to feel as if they are living deep in the forest – directly in touch with the natural environment rather than being disconnected from it, as is the case with many ‘destination’ resorts,” said Soohyun Chang, founder of Atelier Chang. On the interior, guests can enjoy a rather large glamping layout of approximately 164 square feet. The pods feature an open-plan living area with a kitchen and bathroom. Each pod has two comfortable beds. To minimize the resort’s impact on the natural landscape, each pod has a wooden deck, which is raised off the ground by multiple piles. When not enjoying peaceful hikes around the property, guests can make their way to the clubhouse and restaurant. The bright white building, which sits at the center of the resort, was made using the same steel and fabric construction techniques. 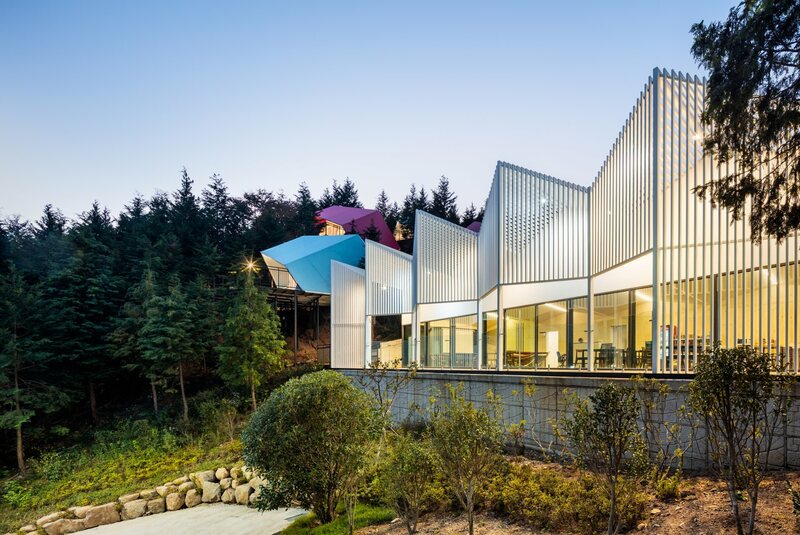 Its zig-zagged facade opens up into a large deck that looks out over the forest. 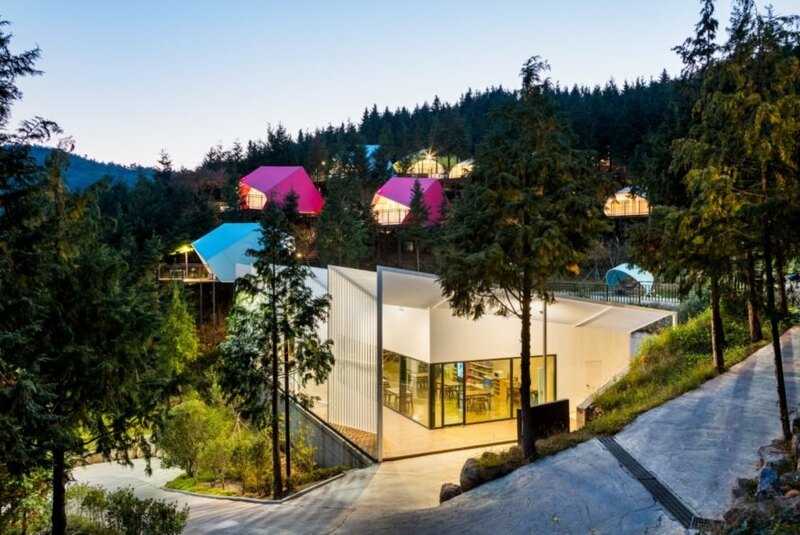 The SJCC Glamping Resort was designed by Atelier Chang. 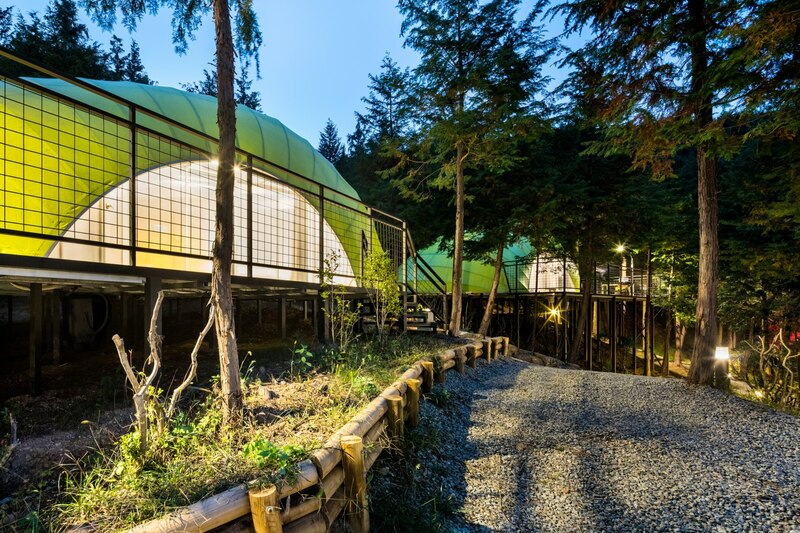 The architects designed the glamping resort to bring a little luxury to the camping experience. The complex looks out over the Suncheon Ecological Bay. The pods are made out of steel frames and covered with brightly colored fabric. There are 16 brightly-colored pods on the site. Each pod has a wooden deck to enjoy the views. The pods all come with a basic kitchen, but there is an onsite restaurant as well. Walking paths lead up to each glamping pod. 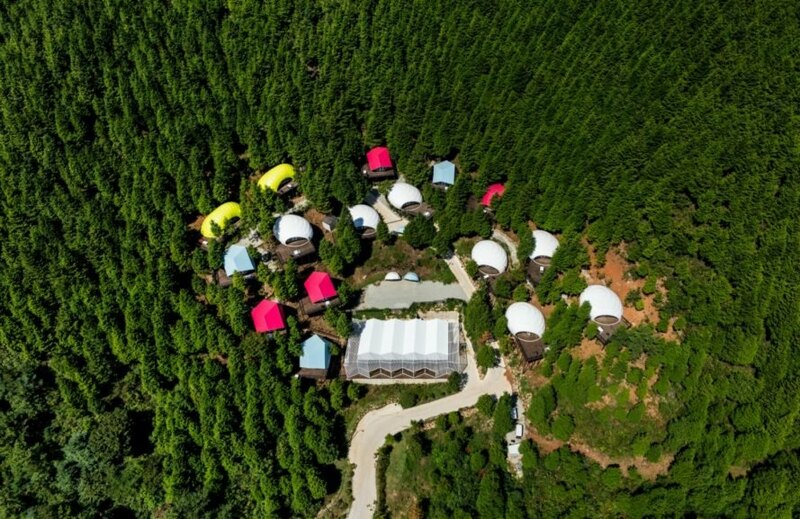 There are 16 glamping pods and a main area for socializing. 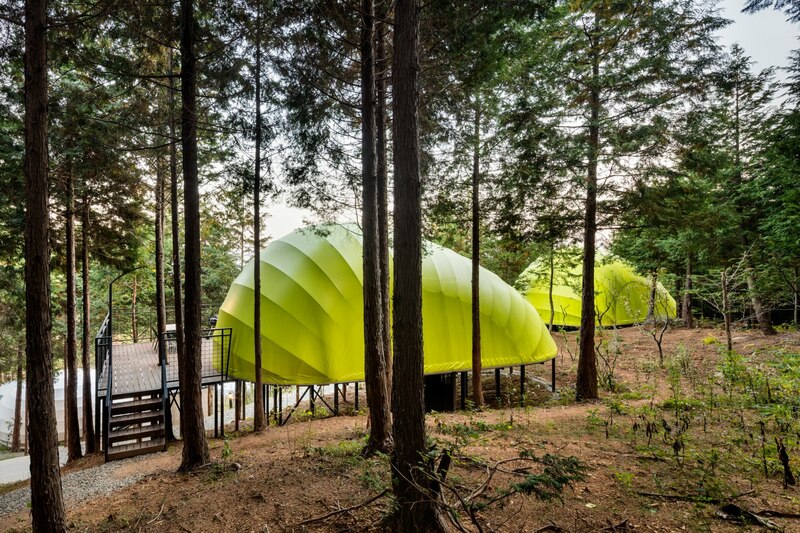 Each pod is insulated to be used year-round. 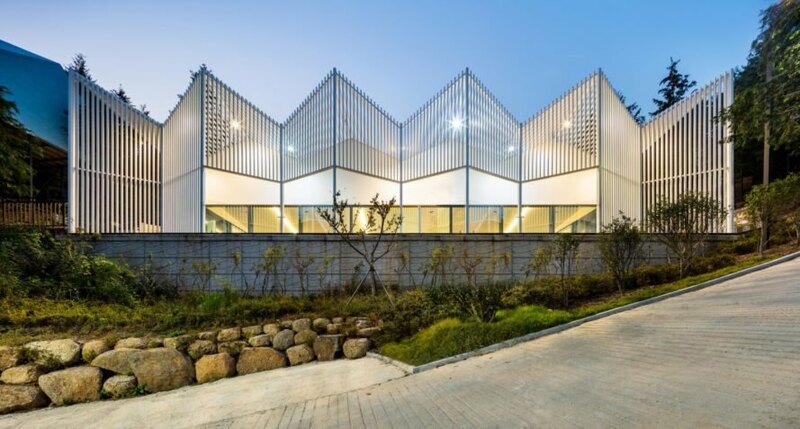 The clubhouse has a zig-zagged facade of white steel louvers. The SJCC Glamping Resort is located located around 300 kilometers south of Seoul. The resort is nestled in a cypress tree forest. There is a central clubhouse that offers a restaurant and lounge space. The clubhouse's terrace faces down the mountainside. Large openings and windows provide stunning views of the area. The pods are raised on piles to minimize impact on the site. Floor-to-ceiling windows flood the area with natural light. Guests can enjoy the stunning views from the clubhouse deck. The design was created to create a strong connection to the outdoors.